I am not a sophisticated observer of the visual arts. I see stuff, I like it, I don’t, I’m moved, I’m bored, I’m provoked, I’m exhilarated — often for no clear reason that I can articulate. I don’t know much about art history, I’m woefully ignorant about contemporary art, and I rarely go to art museums or exhibits or galleries. And although I’d heard of Ai Weiwei, I didn’t know much about him or his work or about his particular brand of activism. I don’t really write (overtly, anyway) about politics or human rights or social issues. This is all by way of qualifying everything that follows as the quite unschooled impressions of someone’s who generally more comfortable with words than with images, and with the fractured past than with the untenable present. But when I read about this exhibit, it went immediately to the top of my must-do list. Ai Weiwei, who is prohibited by the Chinese government from leaving China, designed and oversaw the installation in absentia from his studio in Beijing. I knew I’d kick myself forever if I missed it (the way I’m still kicking myself about Simon and Garfunkel’s September 1981 concert in Central Park). And it seemed like a good family outing: time in the City, fresh air, a boat ride, exercise, beautiful views, exposure to important art and big ideas. It is a good family outing, one I highly recommend. The exhibit also blew my mind. I’m recording my impressions here in part so I don’t forget them. But also to encourage people who can to go to the exhibit (it’s open through April 26, 2015). And to offer an entirely subjective overview of the exhibit for those who can’t go but are interested. After the ferry ride from San Francisco’s Pier 33, a welcome from a cheerful National Park ranger, and an informative introductory video, you make your way to the far side of the island, an area I’d never explored on previous Alcatraz visits. 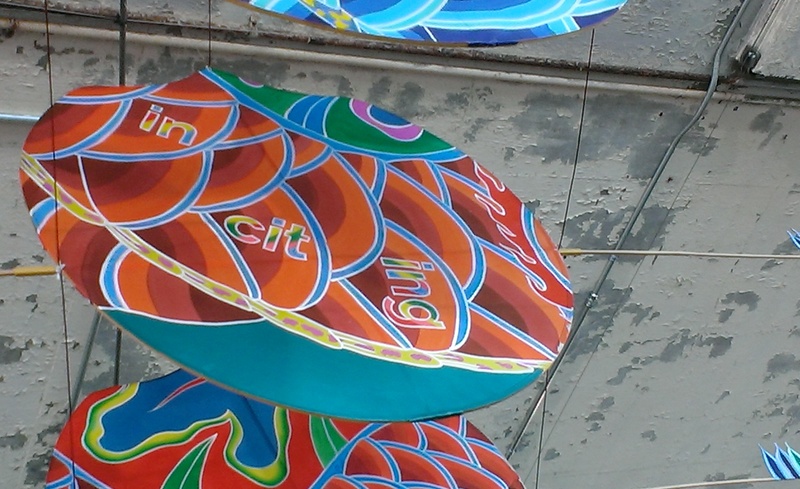 Three large installations occupy the New Industries Building, which was once used by inmates who’d earned work privileges outside the main Cellhouse. First you encounter “With Wind,” the enormous and much-photographed Chinese dragon that snakes its way through a cavernous space in the building’s lower level. It’s impressive in the way of large dragons. And clearly ironic, in that it’s a giant flying creature suspended from and stuck in an old prison laundry facility. 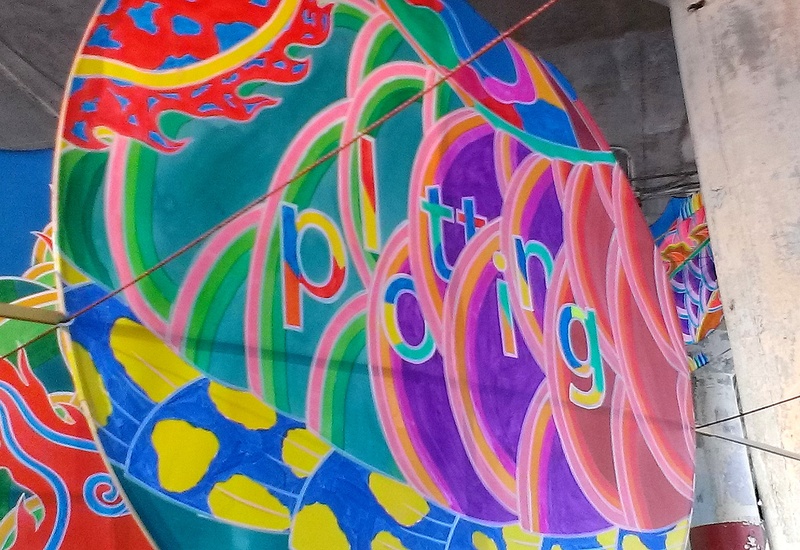 But here’s what’s really cool: you can walk right up to and under the scores of painted wooden panels that make up the dragon’s body, and then you can appreciate, not just the handiwork of each piece and the magnitude of the assembly, but written messages on many of the panels. My favorite one read, simply, “plotting.” Obviously the word carries overtones of political insurrection and criminal behavior. But for a fiction writer it can be suggestive in other ways. Another, pictured at the top of this post, and which I’ve taken for my title, reads, “Inciting.” And most provocatively, in Ai Weiwei’s own words: “Every one of us is a potential convict.” Beyond the dragon, an equally cavernous space houses “Trace,” a huge Lego installation. 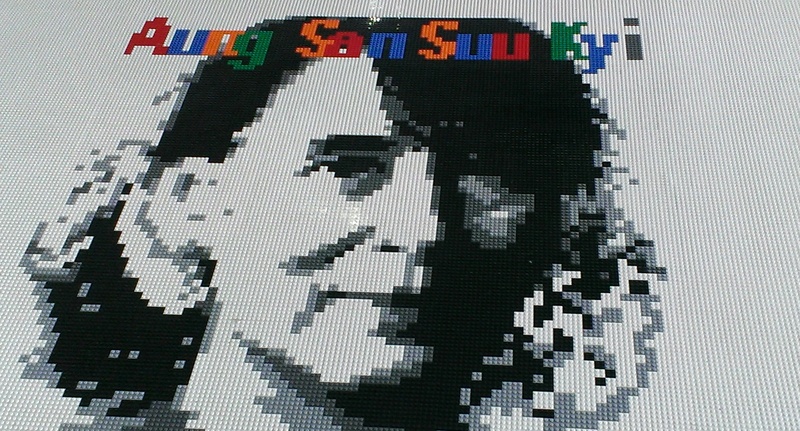 Over a million Lego bricks spread across the floor like a magic and damning plastic carpet, depicting the pixelated faces of over a hundred current or past prisoners of conscience from around the world. Binders located throughout the room contain information about each person, only a few of whom (like Aung San Suu Kyi below) I recognized. I was amazed by this installation, especially by the way it stretched the definition of “art.” It’s not just a cool Lego mosaic: it’s also an enormous research undertaking (determining whom to feature), a writing project (drafting and editing the write-ups about each individual), a computer design endeavor (pixelating and assigning colors for the Lego-ized faces), and a complex logistics problem (the actual Lego panels were assembled by dozens of volunteers on-site using schematics from Ai’s studio). Many, many people were involved in the piece from beginning to end, including the paid docents who staffed the room and had to remind clueless visitors to please not walk on the installation. 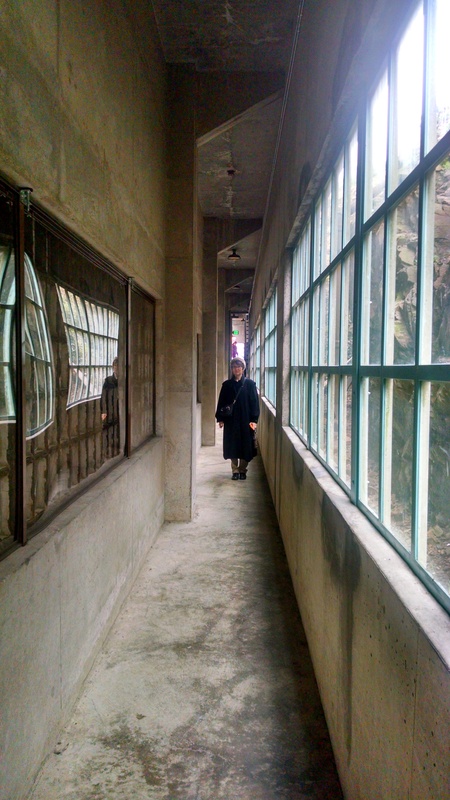 Outside, another docent guided us back into the building, this time through a side door that led to an old metal staircase that dumped us onto a narrow gallery walkway flanked by windows—on one side opening onto the densely foliaged hill just outside, and on the other overlooking, through cracked, age-frosted glass, an indoor space below. I think the walkway was once for armed guards making sure the inmates working below didn’t misbehave. Today, however, visitors can look down on “Refraction,” a gigantic metal sculpture that looked like the recovered wing of some outsize, insectoid, steam-punk flying machine. Again, there was the irony of being on the grounds of a notorious prison, a prison whom not one person is known to have successfully escaped, looking at something so obviously suggestive of flight. But this was far more intense, because not only is the sculpture stuck in the room below. 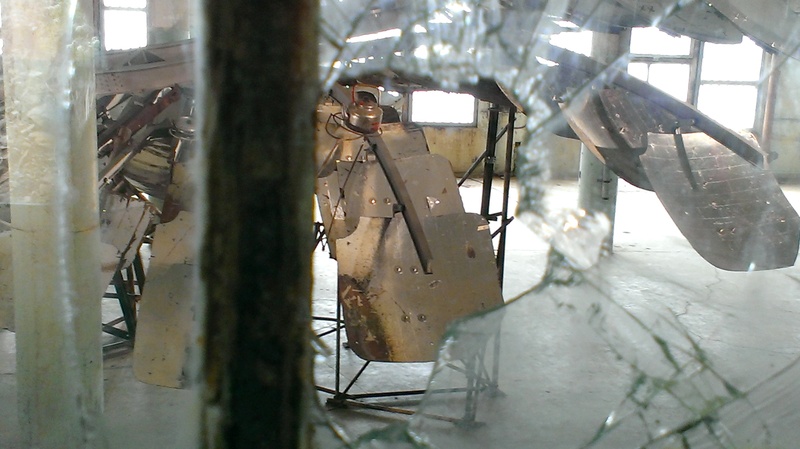 The viewer is stuck on the gallery, unable to get closer to the sculpture (unlike the dragon in “With Wind”), and prevented even from getting a clear view of the piece. You have to make your way along the gallery peering through cracks in the windows, glimpsing only parts of it at a time. From one vantage point I could see an open doorway at the far end of the room below and thought, Okay, the prescribed path will eventually lead down to that door and then we’ll get to see the piece in all of its wholeness and splendor. But you never do get to that doorway. It just tantalizes you from afar, like something out of a Kafka story. One more thing: The piece is adorned here and there with teakettles, as if it’s been colonized by some species of metallic barnacle. At first I found them out of place – why did Ai (or his assistants) solder these silly kitchen utensils onto this large, serious contemplation of imprisonment, fragmentation, and despair? But then I decided I loved it. Because it’s not about despair. It’s about beauty — and whimsy — against all odds. And tea is never superfluous. Strong or weak, scalding or lukewarm, astringent or milky or sweet, it’s comfort and ritual and restoration. If Emily Dickinson could have imagined this, I thought, she might have said, Hope is the thing with teakettles. Beyond “Illumination” lie numerous hospital rooms, some of them quite eerie. You walk down the corridor and stand in the doorways, straining to see if something’s been done to the spaces within to make them “art.” And then you finally see it – a sink filled with ceramic flowers. And then another. And then a flower-filled toilet. And then a bathtub. 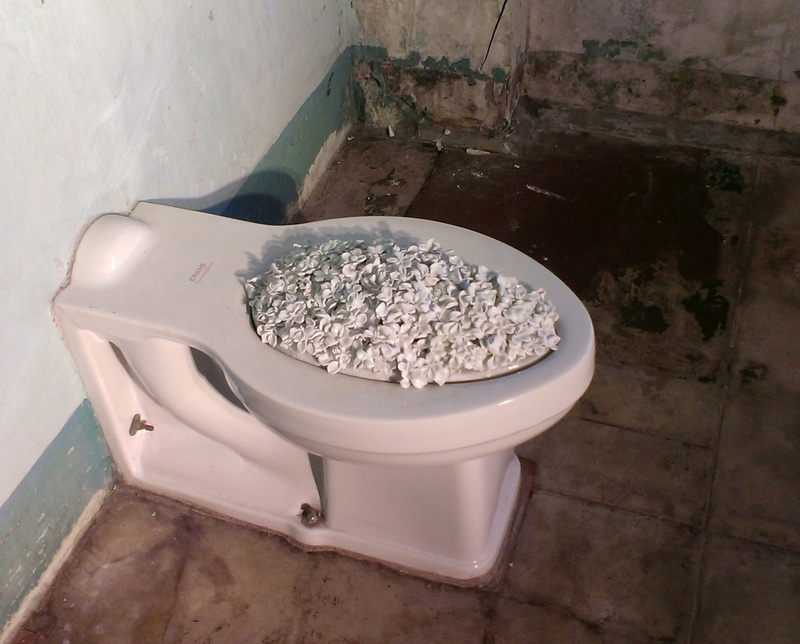 And then one open room where you can approach an actual toilet that actual, sick prisoners once used, and marvel at the bizarre juxtaposition of hardy porcelain, rust- and mold-stained walls, and kitschy ceramic bouquet. Kitsch doesn’t really cancel creepy. I would not want to be alone in this part of the exhibit. 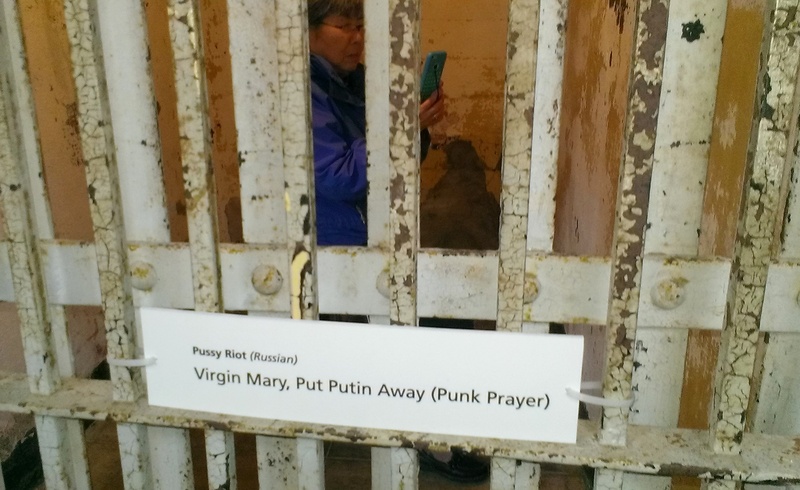 The exhibit concludes in the Dining Hall of the Cellhouse, where you’re encouraged to write personal messages on postcards pre-addressed to prisoners of conscience around the world. This is where you can feel like you’re “doing something,” I guess. I found this part of the exhibit both not enough and overwhelming. How does one avoid coming across as anything other than, “Hi–I’m an American out consuming art at a famous tourist attraction with her family on Christmas Eve and just thought I’d say hello….”? Yet I did write out a couple of postcards, both addressed to grim-sounding detention centers in other countries, and placed them in the large bins provided for that purpose. I wonder how many of these cards actually make it to the intended addressees. And when they do, do they provide comfort? 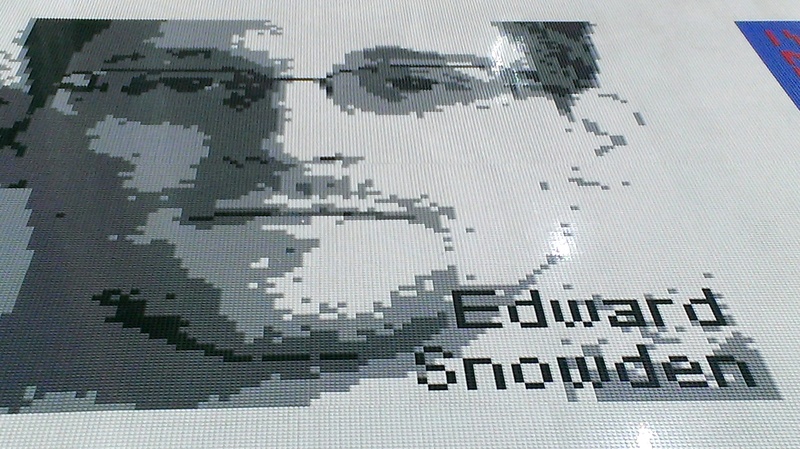 It did occur to me that, for all of our own human rights issues and failures in this country, here was this exhibit, critical of suppressions everywhere, including American suppressions (Edward Snowden was part of the Lego tapestry), taking place on federal land, with the cooperation of the National Park Service. I feel grateful to be in a time and place where that is possible. One of the gifts of this unusual location is that, after having your definitions and comfort zones so thoroughly exercised, you can walk around the grounds to ponder what you’ve just seen before boarding the ferry back to your “normal” life. The whole island is a monument to the temporariness of human intention, including and especially the impulse to incarcerate. 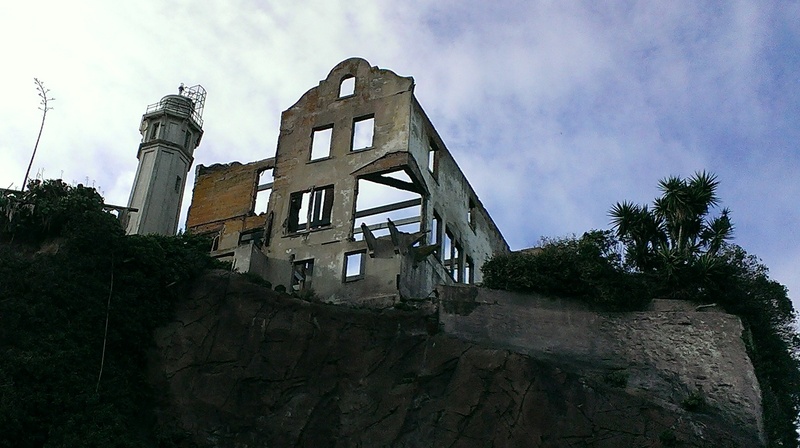 The hollowed-out buildings, bent railings, broken stairs, and cracked retaining walls — everything meant to keep in and keep out — all of it crumbling in the harsh salt air and giving way to mosses and ferns and succulents reclaiming the island (admittedly with some help from volunteer Alcatraz gardeners). The ferry ride back to San Francisco is likewise restorative. Every powerful cultural encounter should include a trip over water at the end. @Large: Ai Weiwei on Alcatraz offers an invigorating, challenging mix of whimsy and play and beauty with deadly serious intent. It’s also an uplifting testament to the power of thoughtful collaboration. Those challenges have really stayed with me in the weeks since we were there. 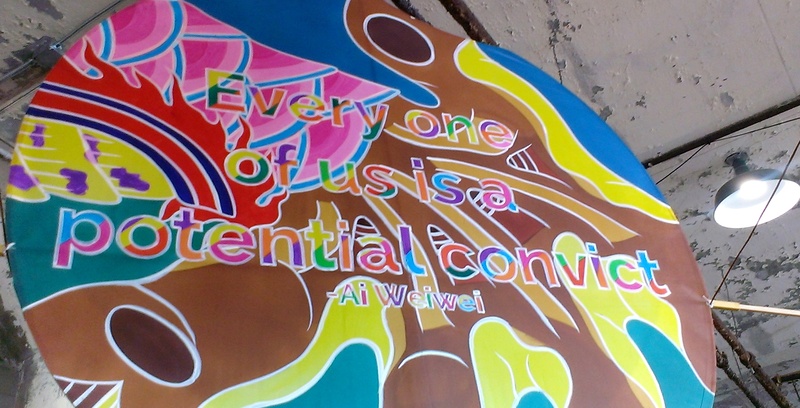 Practical notes: The @Large: Ai Weiwei on Alcatraz exhibit continues till April 26, 2015. Go to Alcatraz Cruises for information, ferry schedules, and tickets. Parking is no picnic near Pier 33 — do some research beforehand. Ferry ticket includes round-trip ferry to Alcatraz, the Cellhouse audio tour, and admission to the Ai Weiwei exhibit. Give yourself half a day for this outing. Be aware that it requires a lot of walking, some of it over steep or uneven terrain and up and down stairs. I’m not sure how accessible the place is for people with mobility issues. And take some food. My mother packed us a bountiful picnic, which we brought with us on the ferry and ate at the dock. We were very grateful, as there’s no food on the island and not much that’s healthful or cheap on the ferry or at Pier 33. Thanks so much for this incredibly thoughtful introduction to the exhibit, Naomi–I am even more excited to go, having read this. Very interesting piece. 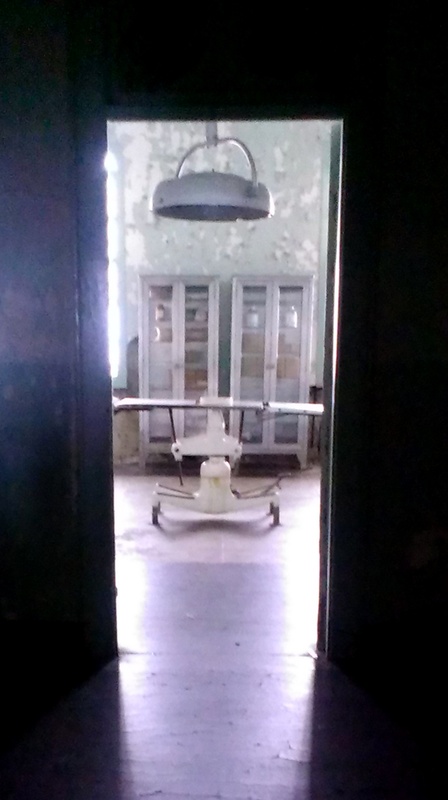 Alcatraz creeped me out so badly when we visited, years back, that I’m not sure I’ll ever return. But what an amazing venue for an exhibit by an artist with so little freedom in his home country. You offer a great and hopeful perspective. Thanks for reading, Susan! I agree that it’s a spooky place, although I’ve always enjoyed visiting (I think this was my 3rd or 4th trip to the island). They do night tours too — *that* would really be creepy, but I think I may try it next.